This is a favorite!! Adding to my inspiration file - you did it again! Orange and gray - so dreamy together! I love the shutters on the wall. Lovely! Yes - love love that combination of tangerine and grey. Thanks for the inspiration. Love! 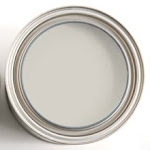 I just painted my stairway in a very similar dark gray/brown color. It is so nice against white. Nice eye candy w. the shutters on the wall. You are so right! Those orange chairs are FAB! Well, don't thos shutters just make this room? Love the orange too. 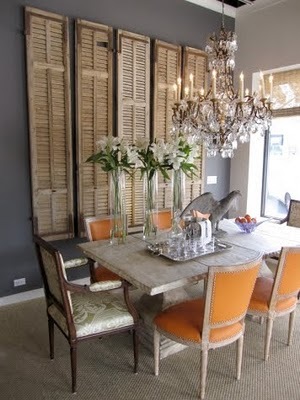 that chairs, the table, the chandelier, the shutters... its a home run! tangerine and gray...yup, just realized, this is my newest love! ... actually Leigha took the words right out of my mouth! 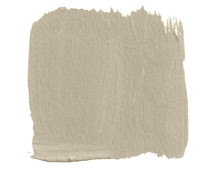 As an homage to your site, I'm starting my own site called "the ugliest gray" featuring all of the different grays I tried out on my bedroom walls, including, but not limited to one that I now lovingly refer to as "dead flesh"....I wish I had found you sooner! Tangerine is such a good description for this color! 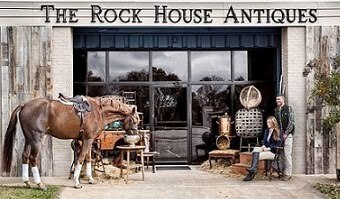 This is actually a picture of a lovely store here in Dallas called Lisa Luby Ryan's Vintage Home. So you can waltz right in an buy all those things! Gorgeous room. Love the shutters. yowza, need to steal, i mean, "creatively borrow" that shutter idea. brilliant! 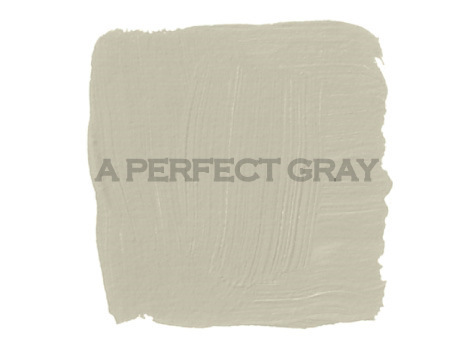 what is it about tangerine and gray that is at once both calming and energizing...? wow...this is super lovely.....all of it!